No joke, my kitchen is only 5 feet long by 2.5 feet wide. It’s well-equipped with a stove, fridge, dishwasher and over-the-range microwave, but it only features 8 small cabinets and 6 small drawers. Yep, I’ve got a small kitchen, but I wouldn’t trade it for the world because I’ve learned how to master every nook and cranny. Besides, its small size also makes me a powerhouse of efficiency when I’m inside. I can empty the dishwasher in 3 minutes flat by not having to lift a foot while I do it and literally everything is within an arm’s reach when I’m baking treats or preparing a meal. It wasn’t always this way, though. I fought with my kitchen for several years. Frankly, it was the only real downside to this condo when we looked at purchasing it. Fortunately, though, through much trial and error and a few handy tools, I’ve learned how to not only love my kitchen, but come to realize I may never want to move again because I can’t bear the thought of leaving it. As it turns out, great things really can come in small packages, kitchens included. If you’ve got a tiny kitchen, too, here are my top 10 tools to help make it more functional, spacious and efficient. Hanging fruit baskets are inexpensive and exceedingly useful. From fruit to spice packets, get it off the counter and up in the air with one of these handy little tools. These can easily be mounted from either the ceiling (if space allows) or even from underneath a sturdy cabinet. Magnetic hooks can help free up valuable kitchen drawer space by enabling you to hang pot holders, trivets and even kitchen towels from the side of the fridge. 3M hooks, oh how I love 3M hooks. Easily removable with special designed adhesive strips, these handy dandy devices are both useful and beautiful as they come in a wide variety of colors and designs. They can literally be placed anywhere to increase the usable vertical space inside your kitchen, including inside cabinet doors to hang cooking utensils, dish towels and pot holders. 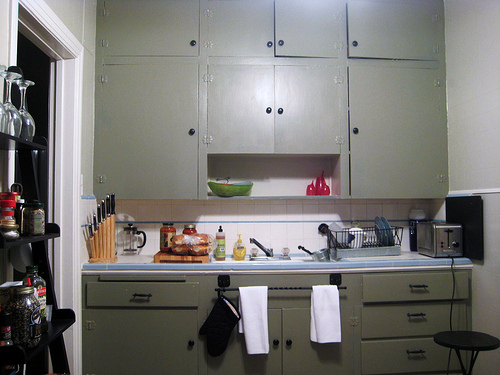 Lazy susans help double shelf space by making the back of cabinets just as accessible and useful as the front. Metal risers and shelves help increase shelf space also by successfully dividing the horizontal space inside cabinets. Metal organizers specifically designed for corner storage of plates and saucers can be especially helpful. Wicker or plastic baskets and bins can help make immediate, beautiful and usable storage space for you up above your fridge. Instead of allowing this space to do nothing but collect dust, consider storing lightweight items such as extra napkins, tablecloths and even chips and crackers up here. Stackable plastic or glass pantry containers not only help keep your food from spoiling, but they keep your pantry organized and uncluttered as well, giving you more space to spare. Small shelves can easily be installed underneath cabinets and along backsplashes to create more usable vertical space for items such as small spice jars, kitchen timers, mugs and recipe boxes. And lastly, multi-tasking tools are a must for any tiny kitchen. If it can’t do at least two different tasks, consider replacing it with an item that can. After all, if something’s demanding valuable real estate in your cozy kitchen, it’d better earn it’s keep to stay there! I have two kitchens but these two are so tiny. I use one kitchen to store all my kitchen tools and the other one for cooking. I am proud to say that my kitchens are well-organized. I have cabinet organizers and I make sure that I use the walls for hanging different kitchen items.